GKH has opened an office in Ardmore. Under the direction of GKH partner Peter Kraybill, the new office extends the services of a general practice law firm to the Ardmore business community and greater Philadelphia area. 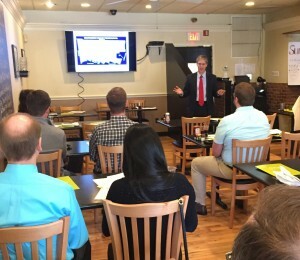 To introduce the firm to the Ardmore community, attorneys Dwight Yoder and Peter Kraybill presented a complimentary seminar, “Commercial Real Estate & Zoning Basics,” on May 15 at John Henry’s Pub in Ardmore. Topics included reducing liability in purchasing and holding real estate, entity formation, agreements of sale, basic steps in land use and development, different types of land use, and zoning issues to watch for when drafting an agreement of sale. Seminar attendees represented a range of businesses, reflecting the diversity of the Ardmore business community. Opening the new GKH office space in Ardmore offers the full range of GKH’s services, 16 attorneys and various practice areas, to the Ardmore community and greater Philadelphia area. The new office will allow GKH attorneys to meet clients in a convenient location in the heart of Ardmore. Clients may also work remotely with GKH attorneys via GKH’s video conferencing capabilities. The Ardmore office of GKH is located in the Times Building in Suburban Square, readily accessible via Lancaster Avenue and the Ardmore station for SEPTA/Amtrak. A map and directions to the office at 32 Parking Plaza may be found here.